The view from the traverse to the Ski Lodge. June was a rough month for me. After my DNF at the Jemez Mts. 50M race, my motivation and enthusiasm for all things running was low. To put that much time and effort into a race to not have a positive outcome was tough mentally, not to mention the physical aspects of running 38 miles/10,000′ of vert. My training in the first half of June wasn’t bad, I just didn’t have a lot of energy during my long runs or speed sessions. So it often felt like I was just spinning my wheels without making any advances. This week finally changed that. Despite a bit of a bruised rib, I managed to put up some decent numbers in both vert and mileage as well as knocking out a long-time goal. Monday: 3.54 M, 748′. Easy power-hiking recovery day. Tuesday: 6.13M, 176′. Due to some work-related schedule shifting, I did my normal easy neighborhood shake-out run a day earlier than normal. Wednesday: 6.14M, 1338′. South Crest Trail 10k loop. It was a beautiful day in the East Mountains with way less wind than the past few times I had been on the trail. I felt really strong on the uphill half of the run. Thursday AM: 4.25M. A couple quick mile repeats at the track before work. Thursday PM: 2.5M, 673′. Easy power-hike. Friday: 2.02M, 747′. Easy uphill walk on the treadmill. When I stepped off I felt like I hadn’t even done anything, which was how I wanted to feel going in to my planned big effort on Saturday. Saturday: Watermelon Loop. 21.07M, 6,273′ of vert. The Watermelon Loop is a popular training course for local ultrarunners. While it isn’t incredibly long, the vert is intense and it is almost entirely composed of technical, mountain trails. I parked at the Elena Gallegos picnic area and took trail 365 to the Tram Station. 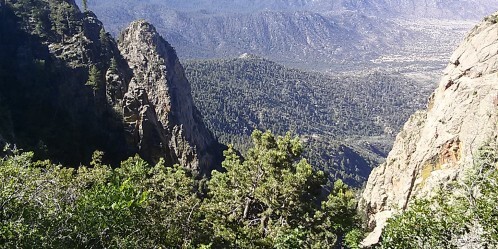 From there, the Watermelon Loop follows the Tram shortcut trail to the La Luz trail. 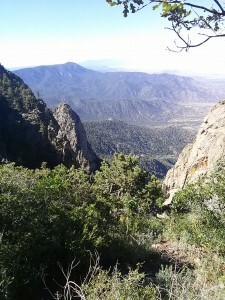 After about 6 miles on La Luz, there is a trail that traverses from near the summit of the Sandias over to the Ski Lodge/Tram station. Just past the Ski area is a connection with the South Crest Trail. This is then followed for a few miles to the Pino Trail summit, which leads back to the start. I was very happy with my effort on this trail, especially considering it was all at an elevation between 7,500′-10,000’+. It felt like the perfect Leadville training run and mostly felt pretty easy all morning. Sunday: 14.37M, 1321′. After a long morning in the mountains the day before, I wanted to do a mostly runnable long run for my Back-to-Back effort. The running part of that didn’t work out too well, but I did cover the mileage and still make it home in time to watch some of the World Cup games.